Left to right, Shalisa Alexander, is welcomed by Jo Ann Zorb of Diamond State CLT and Mary Ellen Gray of Kent County Planning Department, as is her mother, Francine Walls. At Thanksgiving 2015, we were happy to announce our newest community land trust members and home owners. That week, Francine Walls and her daughter, Shalisa Alexander, and grand-daughter, Patience, became the most recent Diamond State CLT home owners. The family took possession of a home in the Rodney Village neighborhood that was acquired, completely rehabilitated, and sold with the financial support of the federal Neighborhood Stabilization Program, administered by the Kent County Levy Court. A grant from the Longwood Foundation and funds from Discover Bank and Deutsche Bank Trust Company Delaware also contributed to making home ownership possible for the Walls family. Project financing came from the NCALL Loan Fund. 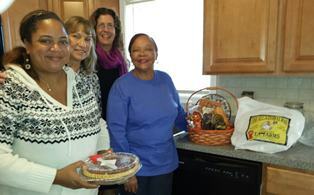 Shortly after settlement, the family was visited by the Diamond State Welcome Wagon Committee which brought a house-warming basket, including a fresh turkey generously donated by TA Farms, Camden-Wyoming. We at Diamond State CLT are grateful to have the Walls family join our CLT community. We are also grateful to everyone who helped us create this new home and offer it to the Walls family.